Below are a selection of photographs taken in units other than the 'main' combat battalions with their own sections on this site. This great photo was kindly sent to me from Frank Glass, who's daughter in law is the great niece of Captain Andrew Best McBride, MC. Andrew is the last man on the right standing on the back row. The photo is dated April 1918, so was probably taken JUST before Andrew's death and Military Cross being won on 24 April 1918. Most of these officers are Captains from various Scottish regiments but there is a smattering of Staffordshire and Kent men and a few Majors to boot. Anyone with information on any of these men would be greatly welcomed as I would love to know who they are! 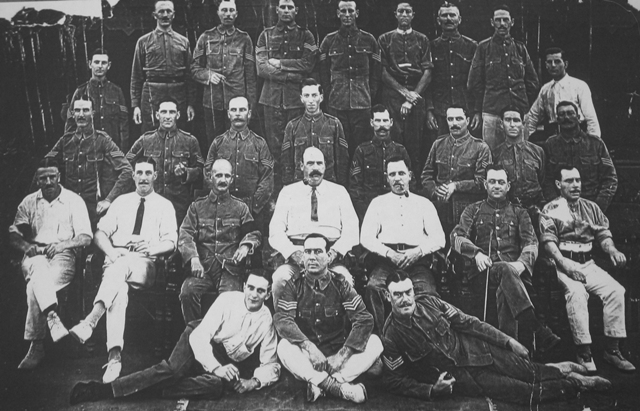 Especially the cheeky looking Major of the Royal Scots Fusiliers sitting fourth from the left on the bottom row! Back row left to right; Quarter Master and Honorary Lieutenant J.C. HOOPER, Second Lieutenant R.D.J. 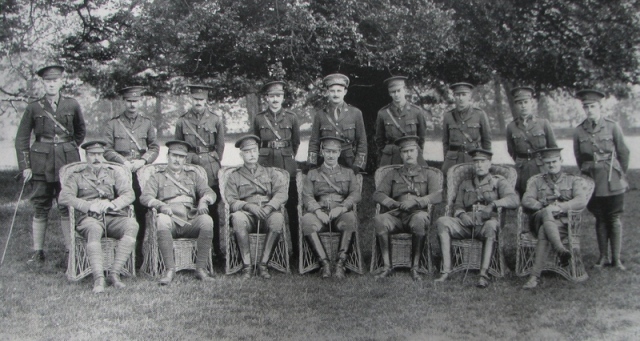 HODGSON, Second Lieutenant Frederick Arthur SANSOM, Second Lieutenant Evelyn Ernest Arnold COLLISSON, Lieutenant Frank Alan SLOAN MC, Second Lieutenant Kenneth L. MALLETT, Second Lieutenant Arthur LANG, Second Lieutenant Andrew Cecil THOM-POSTLETHWAITE, Second Lieutenant Robert Edwin OAKLEY MC. 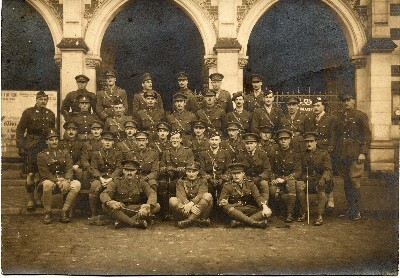 Front row left to right; Captain Rupert Harold GRETTON, Captain Hon. M. St. JOHN (attached from Bedfordshire Yeomanry), Major George Brook YOUNG, Major Frank Augustus Douglas STEVENS (Second in Command), Major A. NELSON (Adjutant), Major Alfred Owen LYON, Second Lieutenant Truman TANQUERAY (attached from RW Surrey Special Reserve). 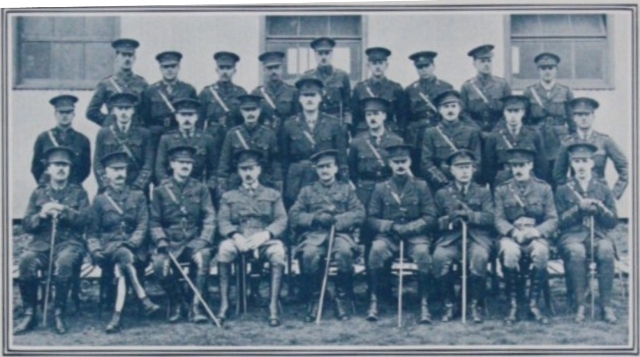 These are the officers of the 3rd Battalion officers in 1915. Based on identifying when certain officers were present and sent abroad, I have been able to narrow the date down to between 6 June and 6 October 1915. As with other group photos on this site, I have identified the officers based on the information provided with the photograph. Any full names have come from my own files, otherwise they are copied verbatim from the caption. Please let me know if there are any errors. Next row (standing): Second Lieutenant H.C. PHILLIPS, Lieutenant Frederick WHITTEMORE, Second Lieutenants Albert William EAST, John Thomas COE, F.C.W. NEWMAN, Harry HARGREAVES, Lieutenant Charles Alan Smith MORRIS, Lieutenant Hugh Armine Wodehouse PEARSE, Second Lieutenant Archibald Clare HOLLAND, Lieutenant Henry DUCHESNE, Second Lieutenant Cyril Shaw SHIPPEY, Lieutenant Johnny W.H.T. DOUGLAS, Lieutenant Edward Stephen M. POYNTZ, Second Lieutenant Ronald Johnstone HAYE, Martin Andrew STEWARD, Richard Owen GOULDEN. Not much is available on the regiment's elusive Garrison Battalions who served in India and Burma, so finding this years ago made a welcomed change. The original appeared in The Tatler's Sporting and Country House supplement of late June 1916, although I have not come across it again since so have been unable to improve on the image quality. The battalion was formed in December 1915 and moved to their posting in February 1916; whether this was taken before sailing abroad or not is unclear. Any full names are from my own files, with those appearing with initials are as written in the original publication. Although a little worse for wear, this small photograph was also an unexpected find, showing those Sergeants still serving with the battalion in 1919. Many had already seen active service, were suffering from the effects of wounds, or were classified as too old for combat service.